Yup, I get all my whole grains from salty snack foods. No stupid whole grain breads, pastas or cereals for me. 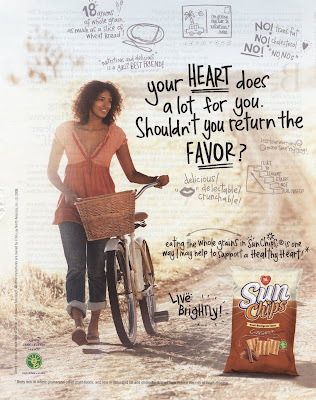 I eat a bag of Sun Chips daily. "Less salt than you think" has got to be good right? Yup, one bag a day. I'm going to do my heart the favour of 21lbs of extra salty snack calories a year. I bet they're really filling too!